This study investigates the influence of owners on their dogs’ performance in a food choice task using either different or equal quantities of food. Fifty-four pet dogs were tested in three different conditions. In Condition 1 we evaluated their ability to choose between a large and small amount of food (quantity discrimination task). In Condition 2 dogs were again presented with a choice between the large and small food quantity, but only after having witnessed their owner favouring the small quantity. In Condition 3 dogs were given a choice between two equally small quantities of food having witnessed their owner favouring either one or the other. A strong effect of the owner on the dogs’ performance was observed. In Condition 1 dogs as a group chose significantly more often the large food quantity, thus showing their ability to solve the quantity discrimination task. After observing their owner expressing a preference for the small food quantity they chose the large quantity of food significantly less than in the independent choice situation. The tendency to conform to the owner’s choice was higher when the dogs had to choose between equally small quantities of food (Condition 3) rather than between a large and a small one (Condition 2). 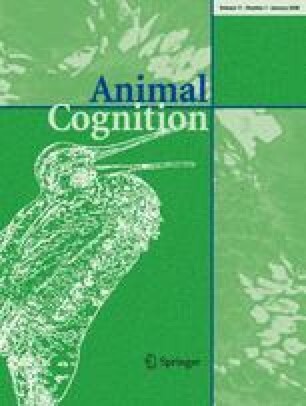 These results provide evidence that dogs can be influenced by their owners even when their indications are clearly in contrast with direct perceptual information, thus leading dogs to ultimately make counterproductive choices. This research was supported by funds from the Università di Milano to Emanuela Prato-Previde, by a doctoral grant to Sarah Marshall-Pescini from the same University and by funds from Università di Parma to Paola Valsecchi. We are grateful to Marcello Cesa-Bianchi, founder of the Institute of Psychology of the University of Milan, for his longstanding support to research on animal behaviour. We thank Marco Poli for allowing us to carry out the work in the Institute of Psychology and for his continuous support, and the “Well Done Training School” and “Scuola Cinofila Viridea” for participating in the study providing help and support. A special thanks to Laura Sabbadini for her invaluable help in data collection and scoring and to Adam Miklósi for suggestions on an earlier version of the manuscript. Finally, we would like to thank all the owners and dogs that participated as volunteers. This research complies with the current Italian laws on animal welfare. Pure-bred dogs tested in the study included 6 Golden Retrievers, 8 Labrador Retrievers, 1 Flatcoated Retriever, 1 Chesapeake Bay Retriever, 1 Nova Scotia Duck-tolling Retriever, 1 Doberman, 4 Terranova, 1 Border Collie, 1 Bernese Mountain Dog, 1 Shetland Sheepdog, 1 Cavalier King Charles Spaniel, 2 German Shepherds, 1 Scottish Collie, 1 Jack Russell, 1 Toy Poodle, 1 San Bernard, 1 Cocker Spaniel, 1 Italian Spinone, 1 Australian shepherd, 1 Afghan hound, 1 Rottweiler.